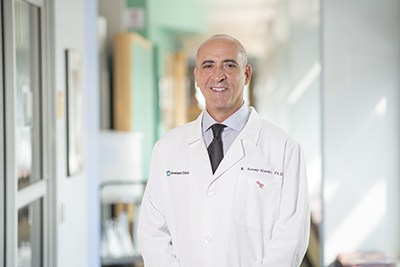 Khalid Sossey-Alaoui, PhD, was awarded a five-year, nearly $2 million grant from the National Cancer Institute (NCI), part of the National Institutes of Health, to investigate pathways that allow triple negative breast cancer (TNBC) to develop and spread. Most breast cancer treatments target receptors on the cancer cell surface that activate the female hormones estrogen and progesterone or human epidermal growth factor. As the name implies, TNBC cells lack those three receptors, making traditional therapies ineffective. Since TNBC cells do not respond well to treatment, it is a particularly lethal type of breast cancer. The new grant will build on earlier work from Dr. Sossey-Alaoui and collaborators recently published in Oncotarget, which shows that levels of a protein called WAVE3 are highly elevated in TNBC tumors and that “silencing” the protein reduces the spread of cancerous cells. A closer look at how WAVE3 works within the cell revealed that it binds with a molecule called YB1 to propagate the population of cancer stem cells (CSCs)—a particularly dangerous subset of cancer cells. These findings suggest that drugs that either inhibit WAVE3 expression or prevent WAVE3 from binding with YB1 may prove to be an effective therapy for TNBC. The NCI funds will help bring Dr. Sossey-Alaoui and his team one step closer to finding such a treatment. Based on their previous findings, the team will test the effectiveness of a cutting-edge nanoparticle drug delivery system designed to make TNBC cells more susceptible to treatment. Nanoparticles, invisible to the naked eye, are engineered to deliver large doses of drugs to specific sites in the body. Unlike conventional therapies like radiation or chemotherapy, this approach reduces the risk of threatening the body’s healthy cells, offering targeted and precision treatment. The system that Dr. Sossey-Alaoui designed will deliver small interfering RNA that prevents WAVE3 translation and expression, helping to resensitize the cells to treatment. The team will also study the intracellular dynamics that contribute to WAVE3’s pro-cancerous effects, including how a chemical change called phosphorylation impacts its functionality and more about WAVE3 and YB1 binding. They will investigate whether other proteins are involved in the WAVE3/YB1 interaction, if phosphorylation affects this as well, and how exactly the binding affects CSCs. This award is Dr. Sossey-Alaoui’s first R01 grant as primary investigator. He is Project Staff in the Department of Molecular Cardiology and collaborates with Edward Plow, PhD, who holds the Robert C. Tarazi, MD, Endowed Chair in Heart and Hypertension Research.